Enveloped in a flavorful stuffing and then wrapped in prosciutto, grape leaves, or parchment, the perfectly cooked meat is revealed only when sliced. 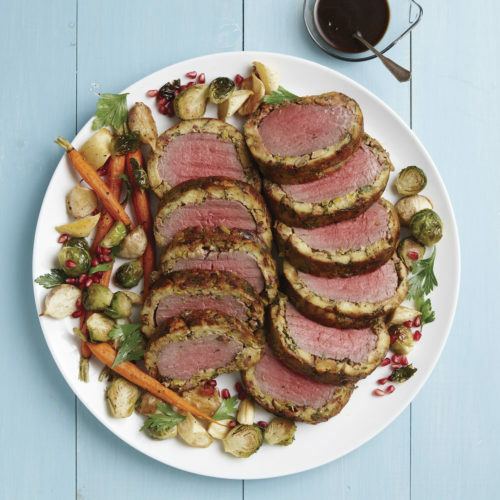 A stuffed roast is special-occasion food, perfect for the holidays. But because I tend to look at things a little differently—my last two features for this magazine were about “backward” braising and reverse searing—I started thinking about how to switch up a classic stuffed roast. Instead of packing the stuffing inside the meat, as is traditional, I thought I’d try wrapping the stuffing around the meat. This inside-out technique turned out to be great: The wrap keeps the meat moist while the meat roasts to perfect doneness. Slice these roasts in the kitchen. 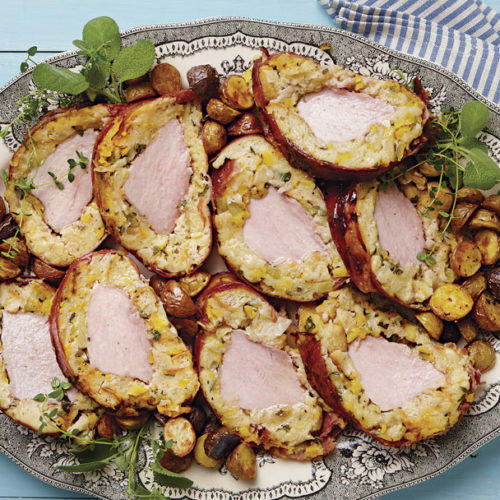 You can certainly platter these “inside-out” roasts whole to present to your guests, but to be honest, not all of them have the same wow factor as, say, a stuffed crown rack of pork. That’s because in order to keep the bread stuffing in place during slicing, the roasts get another layer of wrapping as well. For example, lamb enveloped in a bread stuffing (an unstuffing?) 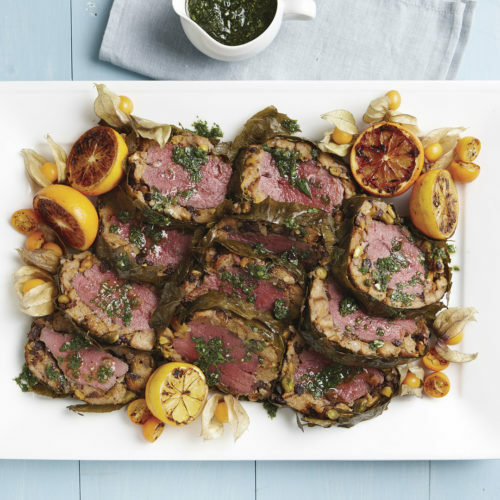 flavored with orange and pistachio gets wrapped with grape leaves, which help to hold everything in place during roasting and slicing. The leaves also keep the meat and stuffing nice and moist, but they might be a little drab to look at. Once sliced, however, the ring of bread stuffing is revealed as well as the gorgeous, perfectly cooked lamb. Put those pretty slices on a platter with some accompaniments, and these roasts can look special indeed. All three roasts follow the same basic method as demonstrated in the video above. Though there are a few steps to the process, most of the work must be done ahead, which makes the roasts a great choice for entertaining. And, as you’ll see, compared to wrapping presents, wrapping a roast is a breeze.